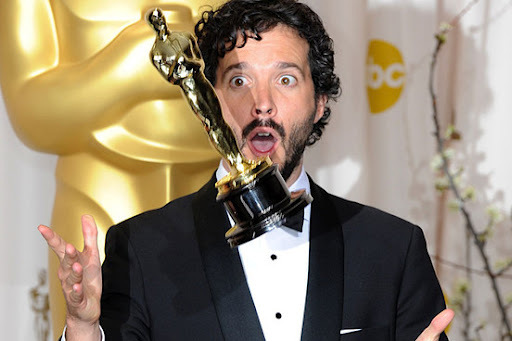 It’s Rhimenocerous extraordinaire Bret McKenzie’s 36th birthday today, so in honour of him and his Flight of the Conchords cohort Jermaine Clement, let’s have a look at the Top 5 Funniest Musical Moments in film. The unfortunately named Stingo (Peter MacNicol) moves from his southern home to be a writer in New York. He rents a room in a house, and so finds himself firm friends with a neighbouring couple, Sophie and Nathan (Meryl Streep & Kevin Kline). Sophie and Nathan have a tumultuous relationship, as she has a tragic past and he has issues of his own, and slowly Stingo learns of their history, and the hardships Sophie has had to endure. In the world, there are happy films. They are stories about underdogs overcoming adversaries, battling against hoards of naysayers as they set out to win the court case/football game/heart of the cheerleader. The kinds of films where, upon finishing, you punch the air and yell something, just to join in the triumphant atmosphere. And then there’s Sophie’s Choice. Watching this film is like receiving one punch to the gut after another, rounded out with a swift thwack to the head with a two-by-four. It’s like watching Schindler’s List whilst listening to country music and drinking a glass of orphan’s tears. If you have a big grin plastered over your face after watching the film, I’m guessing you wouldn’t have been out of place in the Hitler Youth back in the 1940’s. 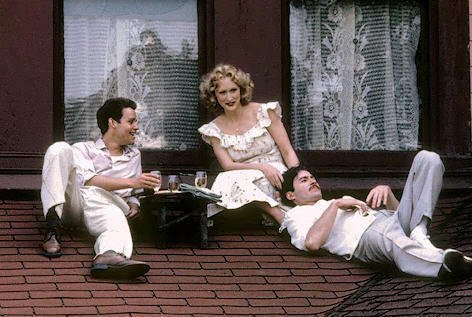 The happiest parts of this film occur between the three leads as they enjoy a life of carefree wonder, visiting Coney Island dressed in period garb, but even these moments have the rug pulled out from them eventually. As with many films on this list, I have a history with this movie. I’d heard it was good, so I borrowed a copy from my Grandad – a copy he’d got free from a Sunday newspaper and never intended to watch, yet he still required it returned after I watched it. Free DVDs don’t tend to have much in the way of DVD extras, up to and including DVD menus. In fact, most will just play straight out, without you needing to touch a button. In fact, I’ve watched one before that didn’t even have chapters. I tried to skip back to catch a line I’d missed, and ended up back at the start of the film, and had to fast-forward to the scene again. What a time we’re living in. Anyway, Sophie’s Choice was such a film that had no extras, just a big old ‘PLAY’ button. I’d heard that, for Streep’s Oscar-wining performance she’d learnt Polish and German for the role, which was not something I’d given a second thought to until, over halfway through this 2 1/2 hour film, there’s the first of a few flashback sequences of Streep’s Sophie in WW2-era Germany, and the DVD had no subtitles, leaving me to attempt to watch and understand what are probably the more famous and pivotal scenes of the film, without the aid of knowing what anybody was saying. To the actor’s credit, for the most part I think I understood it, but still. I’ve known someone to go through a similar situation with Vicky Cristina Barcelona, but that was their fault for watching an illegal download. There are some actors who have a very famous role that they simply cannot overcome for some people, or in this case a role they’ve only played once but that has been seen many times. For me, Peter MacNicol will always, and only, be Dr. Janosz Poha from Ghostbusters 2. The mild-mannered southern writer Stingo doesn’t stand much of a chance against Janosz, seeing as he’s given very little characterisation here, but then this isn’t his film, he’s a cypher through which we get to know Sophie. This film belongs entirely to Meryl Streep, whose performance is just as good as it’s ever been suggested. No superlative can be left unused when describing the levels she goes to, mentally, physically and linguistically, to completely transform herself into the concentration camp surviving Sophie. Her accent is spot-on, and you completely forget you’re watching Meryl Streep. If it weren’t for Kline and MacNicol sharing the screen with her, I’d occasionally have sworn it was a documentary. I’m guessing that Julie Andrews, Jessica Lange, Sissy Spacek and Debra Winger, the other Leading Actress Oscar nominees that year, didn’t even bother showing up to the ceremony. Not only did she learn Polish and German, but Streep goes so far as to convince that they are her first languages, as she trips and stumbles her way through near-broken English, whilst during her flashbacks of the camps she looks to be several days passed Death’s door with her pallid skin, sunken eyes, roughly shaved head and frail, skeletal frame. This performance should be mentioned in the same breath as DeNiro in Raging Bull. It’s hardly a surprise that the rest of the cast pale in comparison. It’s a shame then that her performance is the only outstanding part of the film. I had an understanding of the meaning of the title before watching, so assumed it would play a large focus in the film, but it is only at the climax that we see the pivotal scene, and it’s very nearly glossed over. We get a sense of the ramifications and the how it has made Sophie who she is today, but it eventually turns out that the choice she made would have made absolutely no difference anyway. As a story detailing the personal effects of concentration camps and World War 2 this is compelling, yet there are too many detours to detract from the story in an attempt to lighten the mood – Stingo’s date with the nymphomaniac Leslie Lapidus (Greta Turken). There are some nice comparisons between the camp prisoners and the guards – an officer’s daughter complains about the lack of a heated swimming pool. The film also falls into two of my bigger pet peeve pits, in that a 28-year old MacNicol, who looks about 35, is playing a 22 year old, and at a couple of times there are phone conversations where the person on the other end is almost inaudible, but not quite, so some volume control had to be undertaken. Despite possibly the greatest acting performance ever, this film is unfortunately let down by an incredibly depressing plot and an unsatisfying ending. There’s no doubt it’ll stick with you for a long time, but I highly doubt you’ll ever want to watch it again. Regardless of whether you know the story of Homer’s Iliad, it’s a certainty that you know of the expressions Helen of Troy, Achilles’ Heel and The Trojan Horse. These plot points have become more than the legend of which they are a part, and have entered the modern lexicon as sayings and day-to-day phrases. They aren’t anything new, you know what is means and have heard them a million times before, and the same can be said for every aspect of this film. Lord Dashwood (Tom Wilkinson) passes away and, unable to split his vast estate between his two families, his wife and three daughters are ousted from their palatial mansion by their half-brother John (James Fleet) and his vile wife Fanny (Harriet Walter), and are forced to considerably downsize their opulent lifestyles. 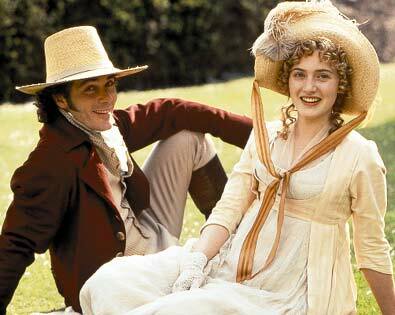 Hope, it seems, arrives in the forms of Fanny’s reserved brother Edward (Hugh Grant) and the dashing Mr. Willoughby (Greg Wise), who each take a shining to two of the Dashwood sisters (Emma Thompson and Kate Winslet). One of the most unusual romantic stories I’ve ever heard, Joseph L. Mankiewicz’s film sees the widowed Mrs. Lucy Muir (the achingly beautiful Gene Tierney) fleeing her haughty, oppressive in-laws and moving to the seaside with her daughter Anna (a young Natalie Wood) and their maid, Martha (Edna Best). Upon arriving at Whitecliff-by-the-Sea, Lucy seeks the assistance of estate agent Mr. Coombe (Robert Coote) in finding a suitable property. She is immediately taken by Gull Cottage, despite the disapproval of Coombe and the warning that no other resident has managed to stay there for even a night. This probably has something to do with Captain Gregg (Rex Harrison), the former owner who passed away there some time ago, and whose spirit still haunts the house. In spite of all this Lucy moves in, and she and the ghost of Gregg form an unusual bond. This could quite easily have gone two ways. Firstly, it could have been a horror, as a family moving into a haunted house is the setup for countless creepy films, yet Lucy’s obstinate refusal to be even the least bit scared of a ghost prevents this territory from being breached. Secondly, it could have gone down the Casper/Beetlejuice route and become a saccharine-sweet, child-friendly and frankly silly comedy-romp as Gregg attempts to scare his latest houseguests away. Both of these options are occasionally dallied with – Lucy’s first encounter with Gregg is all candle-lit shadows, and there is some prank-pulling when Lucy’s in-laws come to visit and drag her back home, but for the most part the fact that Gregg is deceased is all but ignored. He acts more as a confidant and adviser to Lucy, becoming something of a catalyst to changing her life. The casting is spot-on, and no more so than with Harrison. He is the epitome of a salty sea dog, with a rasping, salt-ravaged bark, though his overuse of nautical terms in day-to-day conversation becomes jarring after a while. Tierney is good, and George Sanders is wonderfully sleazy as a suave suitor wooed by Lucy’s beauty. Gregg is a brilliant creation – a man out of his time, especially when it comes to women. His dialogue is peppered with sexism, but it’s delivered in such a way that it’d be difficult to take offence: “You’re a woman, I suppose you can’t help it,” / “Help what?” / “Making a fool of yourself.” Though at times he does come off as more than a little creepy, even for a ghost, when he remarks that Lucy is not a bad looking women (“confoundedly attractive”) even when she’s asleep. The relationship between Lucy and Gregg is well formed and evolves naturally, as she begins to pick up some of his coarse seahand terms that she previously disapproved of (in this world, “Blast” seems to be the worst word imaginable), and they find a way to make the best of their current situation. Like many films it does seem to imply that the only way a woman can make something of herself is if she receives the help of a man. 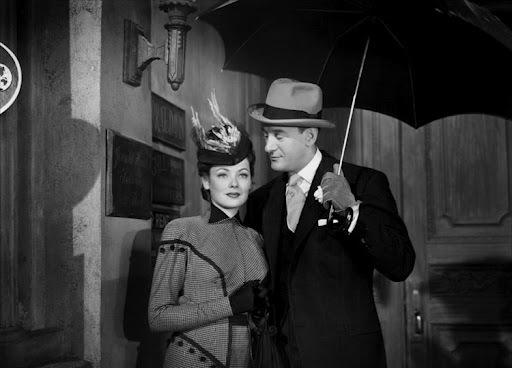 After her husband dies, Lucy has been left just to live off his funds, and had she not encountered Gregg, all would have been lost had she not married some other man, but this notion could be a product of the times when the film was made (1947). If I have one major flaw with the film, it’s that we’re never really made privy to the limitations and frustrations of being dead. At no point does anyone ask Gregg what it’s like to die or be dead, and there seems to be little he could do in life that he cannot do in death. He is not bound to his house, and can willingly interact with people and inanimate objects. In most instances it appears to be better to be deceased, as you are able to only appear to the people you wish to, leading to what I can assume would be much hilarity. The characters too seem unsure of Gregg’s abilities, as shown when Lucy feels embarrassed getting undressed in front of his portrait and covers it with a sheet. Also, many elements of the plot were quite predictable, but overall this is an original and well told story full of lightness and likable characters, even if the ending seems to forget that she was ever married. I was inspired to write this list after listening to a similarly themed podcast from The Film Vault a few months ago, plus it was a post I could write without having to do any research whilst on holiday in a technology-less cabin in Clydach. Now, this isn’t a list of the best and worst films I’ve seen at the cinema (Best: Toy Story trilogy, Lord of the Rings, Cabin in the Woods etc, Worst: Speed Racer, The Mummy 3: Tomb of the Dragon Emperor), instead it’s when certain elements – be they oversights from the cinema themselves or my fellow cinema-goers – have come together to ruin what should have been something wonderful. You’re probably wondering how long it’s going to take me, in this review, to mention a certain other film from 1997, directed by James Cameron, that follows a similar plot to this film, and I’ll tell you that it’ll take exactly 48 words for me to mention Titanic. 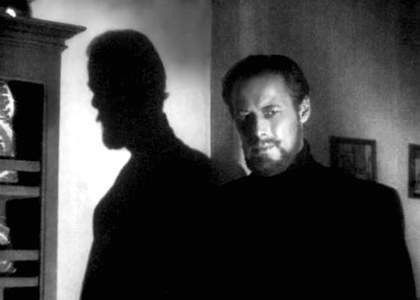 If you’ve never seen A Night to Remember, but are a fan of Titanic (as indeed you should be, for it is a much better film than it’s cool to admit), then you need to start paying more credit towards Night‘s director Roy Ward Baker, for it is from his 1958 picture that Cameron stole most of his film. Now I’m not saying Cameron stole everything, for if there’s one thing Night is missing, it’s main characters to follow through the events. 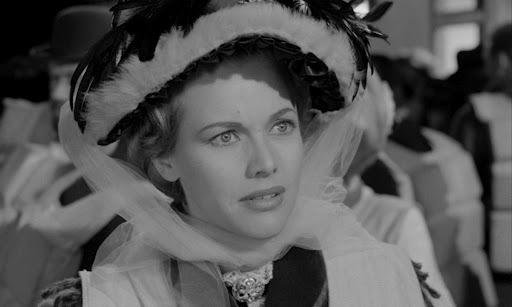 Instead we follow various groups of people – Second Officer Lightoller (Kenneth More), some steerage passengers, a young 1st class couple (Honor Blackman!) – throughout the night of April 14th, 1912. This lack of focusing on a few people leaves you caring for the characters less, in the same way you didn’t care that much when Fabrizzio got hit with the funnel, here its no bother when the same fate is met by other people we’ve been following. This gives Night a more procedural, re-enactment-like tone, not helped by the generally unmoving performances that leave you cold and distant.Had I never seen Titanic, chances are I’d have been far more impressed with this film, but the remake (that’s essentially what it is) has shown that almost every shot can be composed and recorded at least a little better. The fact that it was made almost 40 years later helped drastically, as the technology did not yet exist to encompass the full scope of Cameron’s vision, but the fact that it does now has left Night a little obsolete. I found myself mentally checking off every scene that Cameron stole – the steerage dance number, lavish 1st class dining scene, the soot-caked stokers escaping the closing doors in the engine rooms, playing football with ice on the deck, the dining cart gently rolling down an increasingly listing dining room, the steward appalled at the passengers damaging White Star Line property, the musicians disbanding then reforming to play as the boat sinks. The drunken chef even looks the same, and the shot of Murdoch turning his head away in shame, unable to stand watching the boat sink from his wrongfully claimed lifeboat seat is identical! I understand that a lot of these scenes help to set the atmosphere aboard the boat and couldn’t really be avoided, but Cameron should either have admitted he was remaking, paid some form of acknowledgement to the previous film, or at least changed the shot compositions. Mr. Andrews, the boat’s designer, even at one point gives a young couple – who may as well be called Jack and Rose – details on how to survive whilst he’s stood next to the clock on the mantelpiece, and the ‘unsinkable’ Molly Brown, here played by Tucker McGuire but more famously by Kathy Bates in Titanic, vehemently demands that her lifeboat turn around to help drowning survivors. 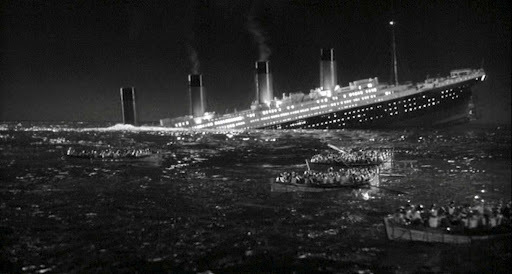 Based on the book by Walter Lord, and using the real-life experiences of survivors, the film paints an effective picture of the differences between the classes – made particularly clear when some steerage passengers attempt to flee the waters, but recoil in shock at the extent of the upper class facilities. After some initial scene-setting and the launch of the boat, we pick up the action on the night of the 14th, as the supposedly unsinkable liner receives warnings of ice in the area. As opposed to after 90 minutes, the immortal line of “Iceberg, dead ahead” is heard after just half an hour. After the boat has struck and a 300-foot long gash has been haphazardly carved into the hull, events play out largely in real time, and a great deal of time is spent on the engine rooms and the crew’s efforts to contact the nearest boats, of which the Carpathia, a good 58 miles and 4 hours away, is the only one to respond. There are some nice examples of the typical British stiff upper lip – a man putting on a brave face as he waves goodbye to the wife and children he knows he’ll never see again – but there are all in all far too many scenes of the crew trying to convince disbelieving passengers of the seriousness of the situation, to the point where I got so annoyed with some of the passengers that I hoped they’d stay on the boat and attempt to sit it out.